The College Books are open for research. This volume contains a fair copy of minutes from Corporation meetings held from Sept. 17, 1750 through April 23, 1778. 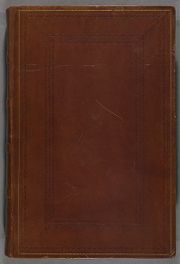 It begins with an alphabetical index and contains entries related to a wide range of topics, including the challenges of operating the Charlestown ferry (due to the river freezing, fear of smallpox, and other issues); increases in "pecuniary mulcts" (fines) for breaches of specific College laws; the establishment of the Dudleian lecture; the selection and financial support of missionaries to various Indian tribes; honorary degrees awarded to Benjamin Franklin and George Washington; gifts to the library as it was rebuilt in the wake of the fire of 1764 (many entries provide the title and author of books donated); the management of land and property belonging to Harvard; Treasurers' reports and other financial accounts; changes in the College laws; gifts to the College, ranging from two Egyptian mummies to a solar microscope; the construction of the First Parish Meeting House in Cambridge and the use of adjacent College property by parishoners; rules of endowed professorships; salaries and appointments; closures due to the threat of smallpox; rules governing Commons and the College Library; reports of various Visiting Committees; class schedules, according to subject; student disorders; the establishment of a designated museum space to display "Curiosities"; the effects of the Revolutionary War on Harvard, including repeated requests to the General Court after the war for compensation for damage to College buildings; the cost of various foods and changes in what was served at Commons; and the danger of the chapel's roof, built of too-heavy slate, falling in. Also of interest are minutes from a May 5, 1761 meeting, which note that the General Court voted to pay for Hollis Professor John Winthrop to travel to Newfoundland to observe the transit of Venus "over the Suns disc."